Come on a dog-loving holiday in Bournemouth! Love your pooch too much and don’t want to leave it home during your holiday? You don’t need to if you’re coming to Bournemouth! Bournemouth has a fantastic range of dog-friendly hotels across its coastal districts. So, if you’re planning a holiday this year, make sure you pack your dog’s bags as well! 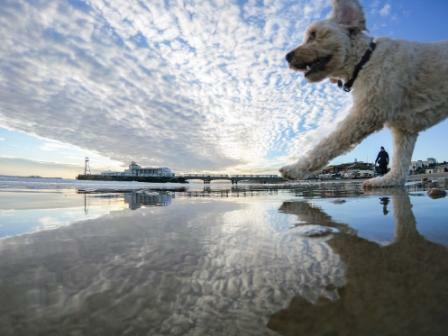 When planning your holiday, make sure you check out Boscombe, a fantastic dog-friendly resort. Here, dogs happily wag their tales in many of the bars, restaurants and hotels. Two fantastic places you and your companion might enjoy staying at are the Bournemouth Beach Lodges and the Urban Beach Hotel. If you want to take your pooch to a concert or stand-up show while on holiday, check out Chaplins Cellar Bar’s extensive range of events. Big tea or coffee drinker? Café Boscanova is worth a visit. And for foodies, we highly recommend Little Pickle Café, Urban Reef and The Neptune Harvester… all offer delicious dishes and are dog-friendly! If you want to be even closer to the beach, the Seafront is a fantastic area renowned for its entertainment and culinary diversity. Fancy an authentic fish and chip supper to share with your pup? Then Harry Ramsden is most worth a try! Whilst at the seaside, make sure to make the most of the scrumptious seafood on offer too at West Beach with their mouth-watering seafood platter… yummy! However, if steaks and grills are more your thing, Key West should be at the top of your itinerary. You can also have a morning coffee or tea overlooking the sea with your best-friend at Off Shore Café or go together for an authentic Caribbean Cocktail at Aruba Beach Bar. If you’re looking for somewhere to stay near the seafront, Hilton Hotel is great for its location, innovative design and friendly staff (who love dogs!). If your preferred holidays are more about retail therapy and trendy eateries, Westbourne is widely known for its continental feel. Unique and quirky– Westbourne has many hidden treasures, ready to be discovered by you and your companion. To help you uncover its mysteries, make sure to fuel up at one of the pet-friendly eateries such as The Libertine, The Westbourne, The Porterhouse, Camden, The Westbourne or Circo Lounge. In terms of your stay, we recommend The Riviera Hotel & Holiday Apartments for you and your four-legged friend. However, if swimming, sunbathing and relaxing is more your cup of tea, you’ll want to stay close to East Cliff and West Cliff. Famous for their spa resorts and the beaches, East & West Cliff provide the perfect setting for you and your pup to relax, refresh and recharge.